In the medical side of Cannabis, a product known as Rick Simpson Oil or simply RSO has become a staple. Many who use this product swear by it as a cure-all, citing everything from dealing with chronic pain, to treating gastric issues, and even so far as curing cancer! RSO was developed in 2003 by a man named Rick Simpson as a treatment for his metastatic skin cancer. After successfully treating himself and going into remission, Rick began promoting his oil nationwide, leading to the staple product that we have today. But what is RSO? 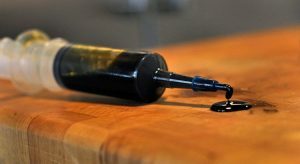 Speaking from a chemical perspective, RSO is an extract made with ethanol and using the whole plant, from stalk to bud. It is made by soaking the plant matter in the ethyl alcohol for several months, simultaneously dissolving the active ingredients and activating the THC. The excess ethanol is then evaporated off and the resulting sticky black substance is RSO. Fully edible and entirely activated, RSO is, gram for gram, the most potent edible that one can ingest, save distillate. One must be fairly careful when administering their dosage, and as a result, more often than not RSO is sold in a needle-less syringe in order to facilitate this. After all, it is easier to get an exact amount out of a syringe than trying to scoop it out of a jar. It is also very important to know exactly how many mg of THC are in each gram. All store bought RSO will have a THC percentage on the packaging, often between 50% and 80% give or take a few. In order to convert this to milligrams simply move the decimal place over one space, for example, a 75.5% THC RSO will have 755mg of THC. Typically on the side of the syringe there will be notches indicating the amount of RSO in the syringe, simply divide the milligram amount by the number of notches to determine how many mg are in each section and this can be used as a method to determine your dose. If you don’t feel like doing any math however, a glob about the size of an uncooked grain of rice is a safe standard dose for a beginner. I would strongly recommend not using any more than this until you know how that amount will affect you, you can always take more, but you can’t retroactively take less. In addition to RSO being an easier method of consumption, there are also various other benefits. Being a whole-plant extract, RSO contains a very strong terpenoid and cannabinoid profile. While present in regular bud, these compounds act very differently when ingested instead of smoked. Due to being processed by the liver and carried through the bloodstream at a slower rate, these compounds have a greater availability within your body allowing one to get the most out of their RSO in medical terms. Another plus to consuming RSO is the elimination of the need to smoke, removing the one potentially hazardous aspect of cannabis consumption. Heck, the only downside to RSO in my experience has been the taste, which is very planty, somewhat like wheatgrass but with a more “weedy” flavor. Of all the ways that one can consume cannabis, Rick Simpson Oil has got to be among the most efficient methods in terms of its sheer medical benefit. With a profile of compounds unseen in any other form of concentrate, RSO has the potential to provide the people who need it with the kind of treatment that simply can’t be touched by other products. If you have a medical need, I would strongly recommend trying some RSO, and as a daily user of it myself I can attest to its efficacy, at least for my own treatment. Do yourself a favor and try it out, it may very well be the “holy grail” you’ve been looking for.